Switch Google Search to Mazor Website with search-switch. There is not any doubt that Google is the best search engine on Internet but some time we want to search only specific sites like Facebook,amazon,Gmail. Google gives you a comprehensive list of relevant results from multiple websites. But if we want a search result from a specific page we can not do that directly from Google. There are many famous services on Internet which we want to search specifically like Gmail,amazon,Facebook and others. We can not search our Facebook account on Google. 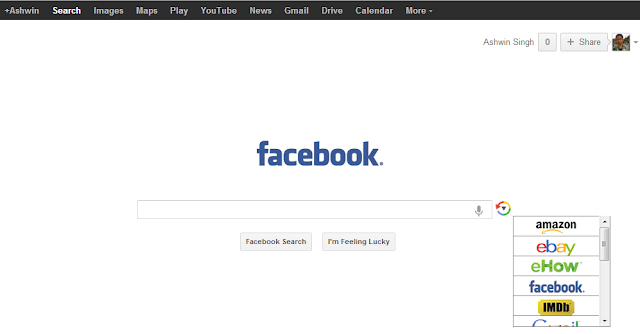 Most of us use Google as our homepage. We can not use mazor website as our homepage. So how to use both at same time. search-switch is an extension for Google Chrome and Mozilla Firefox. After Installing visit Google.com and wait till loading. After loading it takes few seconds to add a refresh button after Google's Search box. Click on the refresh button to see the the sites you can search our just scroll. Click on any site, the Google's logo will change with the selected site and the Google's search button will change with selected sites search button. You can switch search with these sites Amazon, eBay, Wikipedia, Twitter, YouTube, Pinterest, Facebook, Weather.com, WebMD, IMDb, your Gmail Inbox, eHow, Yelp, and RetailMeNot. For changing sites you can use navigation keys or scroll dow and scroll up for use. Chrome users can download search-switch from Chrome's app store but Firefox have to install directly from search-switch' website.search-switch only runs on Google.com and not runs on its sub domains like Google.co.in and other country wise sub domain. Download for Chrome and Firefox from here. Or use DuckDuckGo and add that to your list of search engines in Chrome settings. Hii @Abdul Qoyyuum thanks to share your idea with us.